The NLEFIA-2S paper target was designed in partnership with Law Enforcement Targets (now Action Target). It is a two-sided (2S), multi-purpose target that can address many of the needs an instructor may require in a paper target. It has a silhouette target on one side with a variety of target zones and a picture target on the other side with different target zones. The idea behind this is to provide instructors with a variety of options for their training, and to provide shooters with different looks and target zones to keep the training fresh and challenging. This target can be purchased at the Action Target online store. On the silhouette side, we used the solid gray colored TQ-21 as the foundation for the target. The silhouette has a thick solid black line around it to help it stand out against the white background. Most of the zone lines are faded so they are difficult to see beyond ten yards. The reason for this is so shooters are forced to learn and identify where the best impact zones are on a silhouette (high center chest or eyes / nose area) instead of having an aiming reference point to use that would not be present on a real person. There is a 4" bullseye target on each side of the head that can be used for marksmanship practice or zeroing. The head has a solid line outer scoring ring that we call the qualification zone or “qual zone”. Impacts inside this zone are acceptable for qualifications. There is a bold 4” circle inside the outer scoring ring of the head. That is a reduced target zone we call the “training zone”. Since qualifications represent minimum standards, then training standards should be harder. Therefore, any impacts outside of the training zone during training are considered a miss. That 4” circle is anatomically placed where the eyes and nose are located on a person. The body of the silhouette has the standard TQ-21 solid line outer scoring ring. Again, that outer ring represents the “qual zone” and any impacts inside of that ring are acceptable for qualification. Inside the outer scoring ring, there is a bold 8” circle that serves as the “training zone” for torso impacts. The 8” circle is anatomically placed where the heart and lungs are located on a person. In addition, there is a dotted line 4” circle and a dotted line 12” circle. These two circles have dotted lines to reduce visual distraction from the 8” circle, but are available to be used in conjunction with the 8” inch circle as a large scoring bullseye. Instructors can connect the dots with a marker if they want the circles more visible. Instructors can also attach a solid black 4” circle to the center as an aiming reference in the bullseye for rifle marksmanship training at distance. Lastly, there is a dotted line rectangle in the lower region of the torso to represent a target zone for pelvic or junctional impacts. This target zone is 4”H x 10”W. This target can easily be used for decision-making and target discrimination training by simply attaching various overlays such as a gun, knife, empty hand, etc. The idea with the picture side of the target was to provide a different look, different scoring zones, and some different functionality. 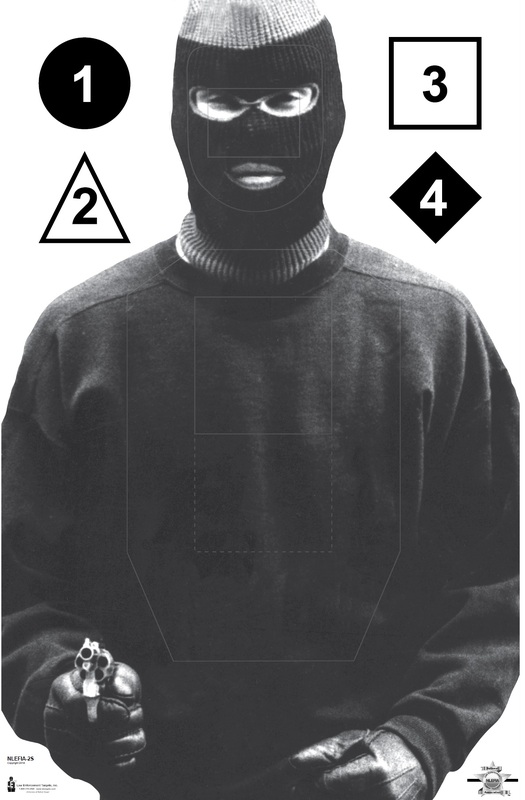 We selected this picture of an armed masked suspect for two reasons. The main reason is this picture does not have any identifying features on the clothing that can be used as an aiming point for students. The other reason is the mask keeps the suspect gender and ethnic neutral. First, the head has the same TQ-21 outer scoring ring as the silhouette side. But, the reduced training zone is a 3"H x 4"W rectangle instead of a circle. And, it’s anatomically positioned over the eyes and nose of the suspect. Next, the torso has the standard IPSC C-Zone solid line scoring area as the outer ring or “qual zone”. The IPSC target is commonly used in training and shooting competitions. Impacts inside the C-Zone are acceptable for qualifications and shooting on the move drills. 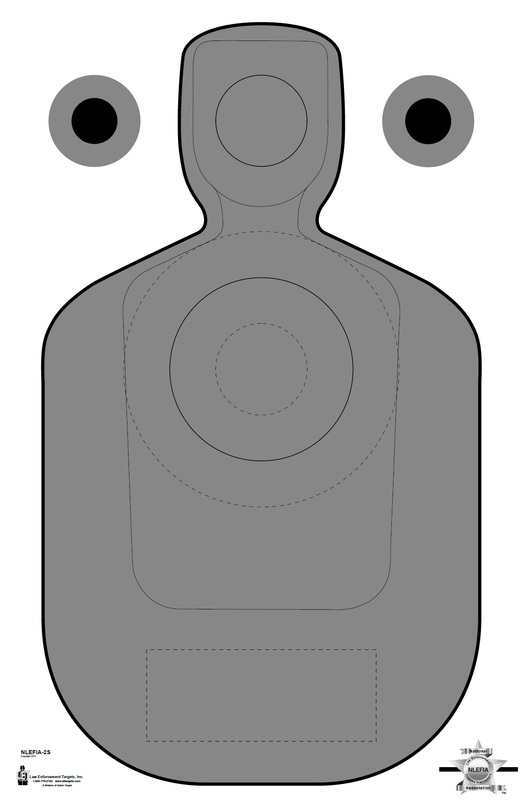 The outer D-Zone on the IPSC target was not included on this target since impacts outside the C-Zone represent poor or ineffective hits on a body. And, that fact is represented on this target. Inside the C-Zone area is a solid line 6” x 6” box that serves as the reduce target zone, or the “training zone” for the torso. Below the box is a dotted line box that is approximately 5”H x 6”W. Together, the two boxes represent an IPSC A-Zone scoring area. No pelvic zone was included on this target. Leaving the pelvic zone off allows shooters to estimate the proper impact area on their own based on the suspect’s hand positioning. Lastly, we added a set of “command” targets on each side of the suspect’s head. These targets are used for decision-making and target discrimination training. Instructors can call out any shape, number, or color for shooters to engage. Many command-style targets use a variety of colors. Black and white was used with this target to keep the purchase cost down. The command targets are 4” in size and can also be used for zeroing and marksmanship tuning.